Battery technologies are ubiquitous in society, as they power many of the small devices we use every day. Research into energy storage has exploded in recent years to make batteries store more energy, deliver more power, and work safely. The Nanostructures for Electrical Energy Storage (NEES) Energy Frontier Research Center (EFRC) studies many aspects of energy storage technology. In one area, known as solid-state batteries, NEES has made great strides over the past few years in drastically increasing the energy and power density of these batteries by making them three-dimensional (3-D). Currently, most batteries are made using a liquid electrolyte (a solution that allows ions to pass through, but not electrons) that separates two electrodes called the anode and cathode. For example, in lithium batteries, lithium ions move between the anode and cathode through the electrolyte. The lithium ions participate in reactions at each electrode, which drives electrons through an external circuit, creating the current that powers the device. This type of battery works well for many applications, from cars to cell phones. However, one downfall is the safety hazard related to the flammability of the liquid electrolyte (think of all the fires caused by electronics in recent years!). Also, making smaller batteries using liquid electrolytes is not easy. Solid-state batteries are of interest because of the potential to replace the flammable liquid electrolyte with a solid and the ability to miniaturize batteries for specific applications, like implantable medical devices. When replacing a liquid electrolyte with a solid one, there are new challenges to solve. The movement of ions through solid materials is often much slower than through liquids. This characteristic means that the amount of power (how fast energy can be provided) that the solid-state battery can deliver is often not as good compared to liquid electrolytes. Further, this slow movement of ions makes it difficult to increase the capacity of the batteries. 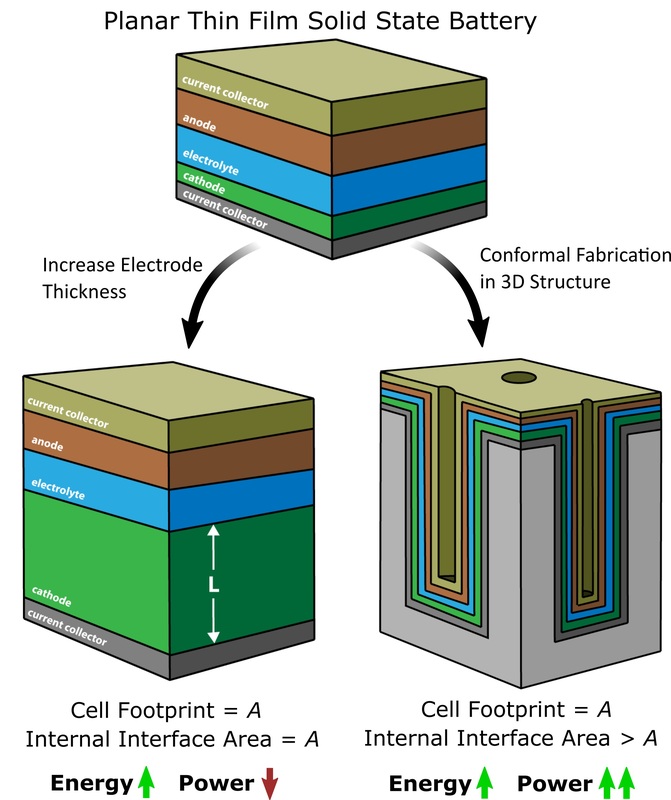 The first demonstrations of solid-state batteries were planar, meaning they were made of flat layers (as illustrated in the figure). Making the cathode material thicker will increase the battery capacity by increasing the amount of active material that can react, but the ions cannot move quickly through the electrode because they have a longer distance to travel, so the power will be low. Researchers in NEES determined that making a 3-D structure with thin films could solve both energy and power issues. By adding a 3-D structure, more active material can be placed in the same area (see figure), and making the films thinner means that the ions do not have to move as far through the materials, increasing energy and power, respectively. However, the researchers needed a deposition technique that could deposit uniform, identical layers of material onto the 3-D structures to achieve their goals. To solve this problem, the team turned to atomic layer deposition (ALD). ALD uses different compounds (called precursors) that in their gaseous state selectively react with the surface of a sample to form the desired solid material. One precursor at a time is pulsed into an enclosed vacuum chamber holding the sample, and multiple precursors pulsed in a sequence will grow the material one atomic layer at a time. ALD is like building layers in lasagna—you need noodles, cheese, and sauce alternating in different layers according to a precise recipe for it to bake and hold together properly. If the ALD precursors are not pulsed into the chamber in the correct order and in the right amounts according to the ALD recipe, either the material won’t grow, or it may have the wrong composition. Because these reactions occur only at the surface, the materials grow very uniformly and conform perfectly, matching the shapes in the 3-D structure. To realize a 3-D solid-state battery made entirely by ALD, recipes for five different materials needed to be developed and tested. All five materials deposited in the 3-D structure are illustrated in the second figure. Many of the recipes had already been developed, but two final pieces were needed—an electrolyte and an anode. An appropriate electrolyte in the lithium phosphorous oxynitride (LiPON) family of materials called lithium polyphosphazene had recently been developed in an effort spearheaded by graduate student Alex Pearse. This achievement meant only an anode material recipe still needed to be created. David Stewart, a postdoctoral researcher in NEES, led the effort to develop an anode using tin-based ALD processes in the lab. He started by investigating a more well-known ALD recipe for tin oxide but also developed a process for tin nitride. By considering both materials, Stewart investigated intermediate compositions of tin oxynitride, which contain both nitrogen and oxygen, to determine how the oxygen content affected the performance of the anodes. Oxygen can sometimes contaminate ALD films, and understanding its role was crucial to determining the best recipe for the tin nitride anode. With the ability to precisely change the order and amount of nitrogen and oxygen exposures, he determined that small amounts of oxygen contamination do not negatively impact the anode performance. 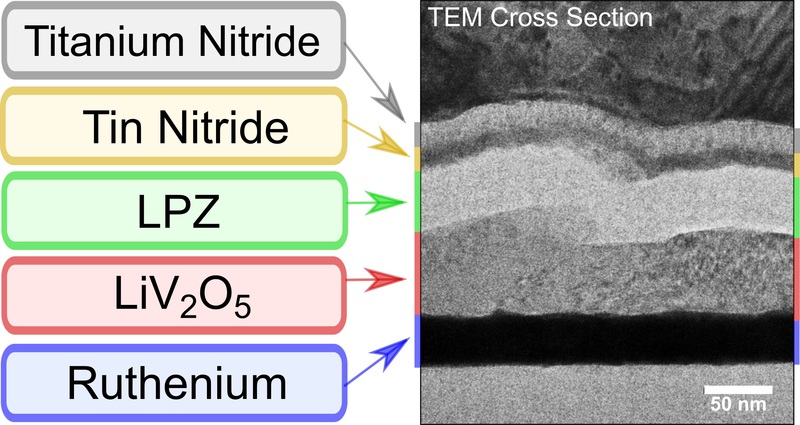 Further, he found the new material tin nitride was the better anode material, as it could store more capacity and retain 75 percent of the initial capacity over 200 cycles, while tin oxide only retained 50 percent capacity after 200 cycles. With this final ALD process created, the last material needed for the 3-D solid-state battery was ready. To begin building the battery, tunnel structures were created in silicon whose depth could be increased or decreased, illustrated in the first figure. By increasing the depth of the tunnels, the amount of internal surface area was increased while keeping the overall area the battery occupied the same. By making deeper tunnels, they could deposit more material in the given area and keep the films thin. The five materials NEES researchers developed were successfully deposited over the 3-D silicon tunnel structures to create working devices made entirely using ALD, as shown in the second figure. With more internal surface area, the energy stored per square centimeter of the silicon wafer increased as expected and showed better power capabilities compared to planar batteries over 100 cycles. These successful results highlighted the capabilities of ALD for solid-state batteries and opened the door for future studies using this technique with new materials and structures to further increase energy density. Scientists working together is a principle that lies at the heart of successful EFRCs and was epitomized in the effort to bring the 3-D solid-state battery to fruition. While work on the 3-D solid-state battery and development of ALD processes was spearheaded by NEES EFRC Director Gary Rubloff, contributions from other research groups within the EFRC were instrumental to the success of this work. The different research areas within the NEES EFRC met once every two weeks to give updates on research and discuss important data and findings. From these meetings also came collaborations, with groups across the country producing samples for each other, sharing tricks and techniques, and collecting data to be shared with the whole EFRC. Having collaborators saved the day when the team was having issues with one of the battery materials. Stewart recounted, “We would have spent months troubleshooting a simple but necessary step in our battery production process without our collaboration with Alec Talin.” The different perspectives and advice from the other groups helped work progress at a much quicker pace in creating a 3-D solid-state battery. “Their experience and help with our samples kept us on track,” Stewart said. Atomic layer deposition and collaboration have been demonstrated as powerful tools to create the first 3-D solid-state battery made of materials deposited entirely using ALD. Pearse et al. All aspects of this work were initiated and supported by Nanostructures for Electrical Energy Storage (NEES), an Energy Frontier Research Center funded by the U.S. Department of Energy, Office of Science, Basic Energy Sciences. Some aspects of the 3-D array microfabrication process were partially supported by Independent Research and Development Funding from the Research and Exploratory Development Department of the Johns Hopkins University Applied Physics Laboratory. The researchers also appreciate the facilities and support within the Maryland NanoCenter, including its Fablab, for device fabrication and its AIMLab for microscopy and focused ion beam. Ion milling was performed at the National Institutes of Standards and Technology Center for Nanoscale Science and Technology. Stewart et al. This work was supported by Nanostructure for Electrical Energy Storage (NEES) II, an Energy Frontier Research Center funded by the U.S. Department of Energy, Office of Science, Basic Energy Sciences. Emily Sahadeo is a graduate student at the University of Maryland in College Park. She is a member of Sang Bok Lee’s research group, and is part of the Nanostructures for Electrical Energy Storage (NEES) Energy Frontier Research Center. Her current research focuses on studying the role of surface chemistry and interphase layers at the electrode/electrolyte interface for nanostructured electrode materials in magnesium battery systems.